When using a public restroom, some hyper hygiene-conscious individuals opt to hover over the bowl or spread toilet paper around the seat, as opposed to sitting. They may be onto something, if we consider statistics from the Infectious Diseases Society of America (IFSA) cited by Everyday Health. According to the news source, the medical organization has found more bacteria than its charts were able to quantify in some public restrooms. Meanwhile, in an advice column that recently appeared in the The Chicago Reader, a reader asked if there's any credence to an old statistic showing that only 2 percent of women dare to sit directly on public toilets, choosing to hover or put paper down instead. The writer of this syndicated column, "The Straight Dope," confirmed that a study showing these results did, in fact, appear in the British Journal of Obstetrics and Gynaecology in 1991. 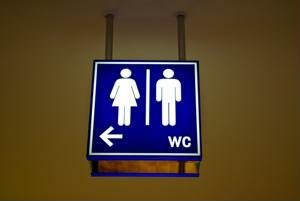 However, an informal survey he took on a message board indicated nearly the opposite - more than 80 percent of the almost 150 women who responded said, under the right circumstances, they wouldn't have a problem sitting on a public toilet seat. Some information provided by other experts indicates that that 80 percent of the Straight Dope's survey has the right idea - especially if these women are more concerned about washing their hands. Ironically, a different advice column appearing in the Mother Nature Network (MNN) points out that the toilet isn't necessarily the most disease-ridden object in a poorly-maintained public bathroom. Author and blogger Chanie Kirschner pointed to a 2008 report from CNN where University of Arizona microbiologist Charles Gerba called toilet seats one of the cleanest things in most bathrooms. What people should really watch out for, according to Kirschner, are public bathroom floors, door handles and sinks. She advises rigorous hand washing after public toilet use - at least 20 seconds of scrubbing with soap - and using the same paper towel used to dry the hands to turn the doorknob on the way out. In addition, it's best to avoid touching anything that's been on the floor of public bathroom. Although it seems like an obvious rule of thumb, washing your hands after you use the bathroom is not a practice to take lightly. Diseases one can catch from an unclean bathroom as cited by MNN include hepatitis A, salmonella, and less severe illnesses such as colds and flus.